Woke up in my tent across from the YMCA to the sound of cars and people headed in for their morning workouts. Packed up and pedaled into town to grab a quick breakfast. Then stopped by the Cumberland Trail Connection bike shop before hitting the C&O Canal trail. The bike shop’s owner told me if the trike had a breakdown along the trail to give him a call him and he would retrieve me. Appreciate that, Hutch. Always nice to know someone has your back. Before leaving, saw this humorous Uncle Sam wind spinner outside the shop, which cracked me up. As I was planning my trip, a friend had actually suggested I traverse the country in this very same Uncle Sam outfit, complete with top hat. The funniest part is he was serious. Made it through the first gate two miles down the path without incident. Only 182 miles left to DC, but embracing the old Japanese maxim sent from my friend, Clifford: ‘When in the face of victory, tighten your helmet strap.’ Good advice, particularly given all of yesterday’s incidents. Some light snow flurries were coming down when I hit the trail, which I had pretty much to myself, save one biker I saw camped out during the first couple of miles. Lots of mud puddles to negotiate, but otherwise good trail conditions. As the mile makers to the end of the trail started ticking down one by one (184, 183, 182…), I felt the urge to slow down, as part of me doesn’t want this journey to end. Saw nine deer, one wild turkey and lots of evidence of beaver during the ride today. Frankly surprised I saw any wildlife at all, given how much noise the trike makes vibrating on the rough gravel path. Was a cold (highs in the mid 30s), but beautiful, day for riding. Ran into locals Bob & Sue Steine on the trail, who were camping. Told me if I hadn’t already passed Lock 49 by the time they got home on Monday, I might be able to stay in the Lockhouse. They’re Quartermasters there, and were fairly confident it would be available for a night or two. Logged that away as a possibility. 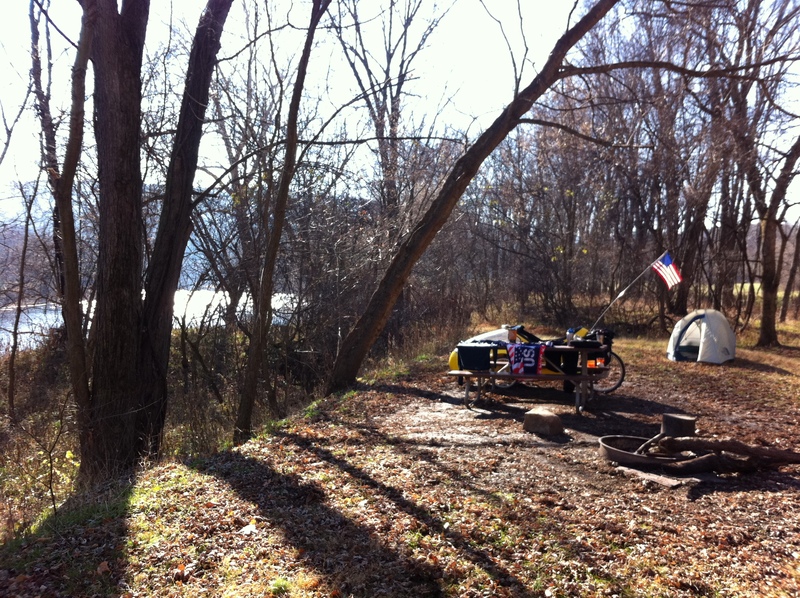 Settled on one of the many designated campsites near the banks of the Potomac River. Pitched my tent and built a fire to keep warm. Calling for a low of 28 tonight. 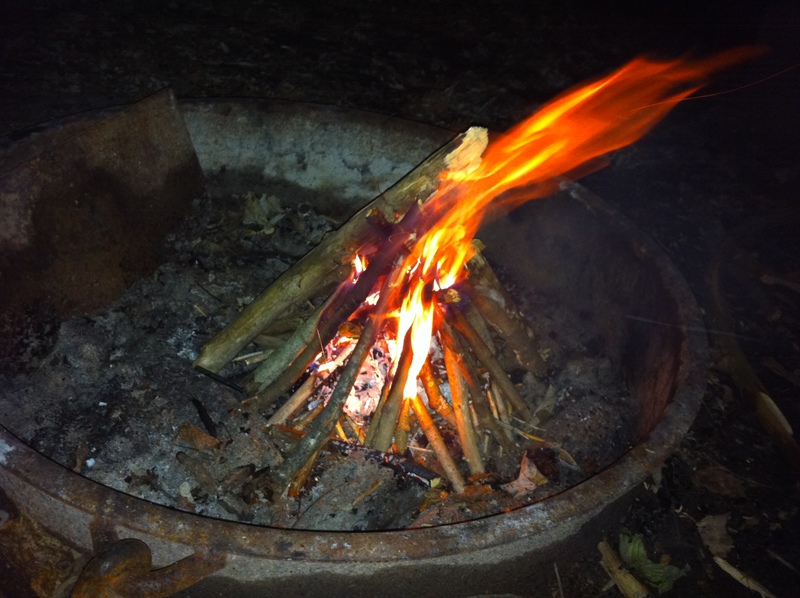 Sat out for a couple of hours until it started burning low, then retired to the tent for some blogging and sleep. Including side trips, pedaled a modest 35 miles today. Pedaled about 8 miles up the trail this morning to the Eastern Continental Divide, which divides the Gulf of Mexico and Chesapeake Bay watersheds. A couple miles later, was relieved to see the doors to the Big Savage Tunnel still open after the ice storm. Rode through the 3,100’ tunnel with no lights to get the full effect. Had to have a little fun with the video. 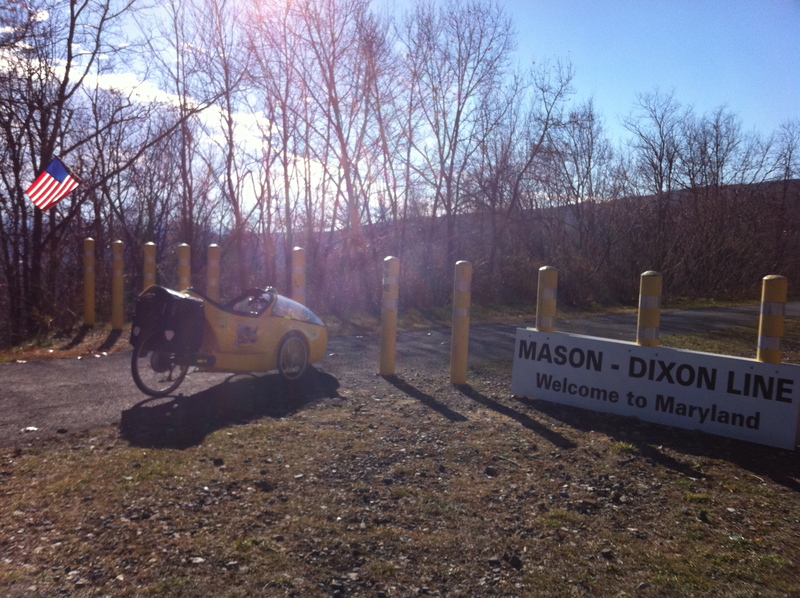 Shortly after coming out the other side of the tunnel, I crossed the Mason Dixon line and it was literally all downhill to Cumberland, MD. Really enjoyed being able to coast downhill for miles the first time this trip. Awhile later, ran into Cumberland-based Adventure Cycling Association guide, Larry Brock, and rode with him into town. Was good to have some company for a change. Pedaled through the Brush tunnel (this one actually shared by trains), built in 1911. Then Larry turned me onto the Cumberland Bone Cave, an ancient cave with fossilized bones from over 200,000 years ago. Skeletons discovered in the cave include those of the “Cumberland” Cave Bear, a Saber-toothed cat, even a crocodile. 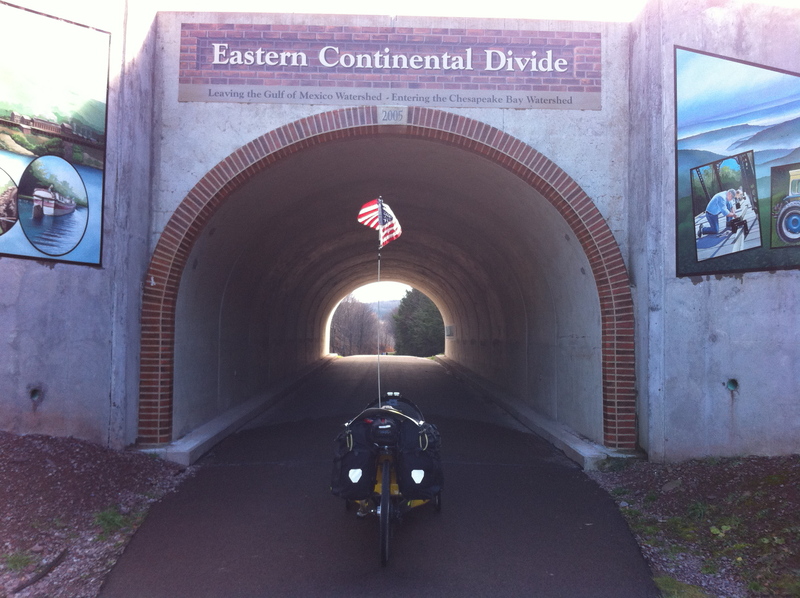 Asked Larry’s advice on whether the trike had the clearance to make it down the C&O Canal bike path (had been getting conflicting views on this) and he wasn’t sure, so he took me to the C&O Canal Visitor Center. They were equally unsure, but said I would know within two miles when I hit the first gate. Good enough for me. 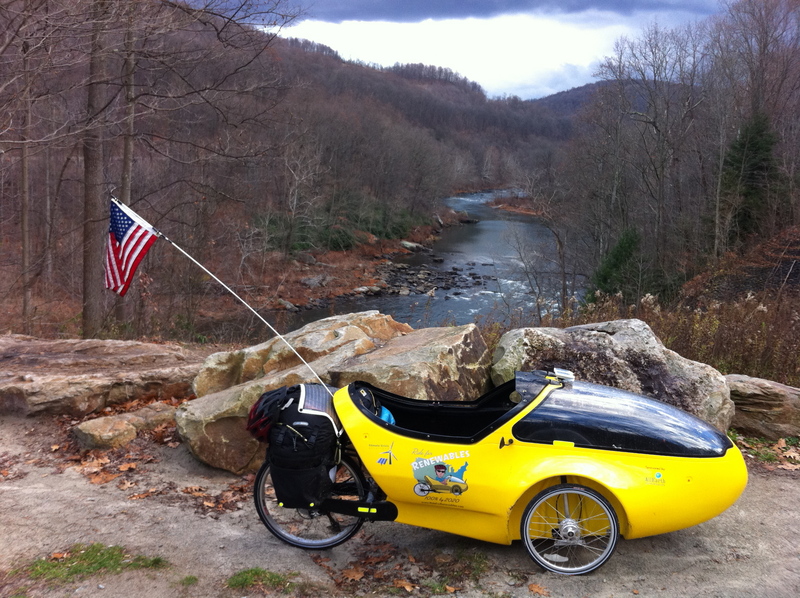 Said goodbye to Larry and rolled up to the Cumberland Times-News for a quick interview and shot of the trike. As Ken was conducting the interview on the sidewalk, a car accident unfolded in front of us on the street. No one was hurt, but I watched the front bumper of the rear car explode upon impact, little pieces flying through the air. Then I turned to my left and watched a large man attempt to jump onto a moving steam train that was backing into the station, and almost fall under its wheels. Two accidents in as many minutes was enough for me. For the newspaper shot, decided to walk the trike down the sidewalk to a side road with very little traffic. No sooner did I get in than a car came barreling toward me, pulling to a stop a little too close for my personal comfort. A panicked-looking young woman on her cell phone jumped out and ran past me to the scene of the accident, without giving me a second’s notice. Thanks, Ken, for yelling at her to slow down. Very happy to be taking bike trails the rest of the way into DC. With 40 miles on the day, rolled down the street to the YMCA, where I pitched my tent ($10/night) and went inside for a sauna. Then walked down the road to a local bar for dinner and a few cold beers (thanks, Brian!). Walking back down the dark, deserted road to where my tent was pitched, talking to my friend Paul on the phone, I was surprised to see the tarp I’d placed over my trike was on the ground, and my tent gone. Upon closer examination, found the tent sitting upright about 40 feet across the lawn. The swirling wind had blown the staked tent end over end across the lawn and blew the tarp off. Could have made for a very cold night, and long walk to Washington, DC! When I woke up this morning, the streets were deserted and everything was coated with ice, with a cold rain coming down, so no riding today. 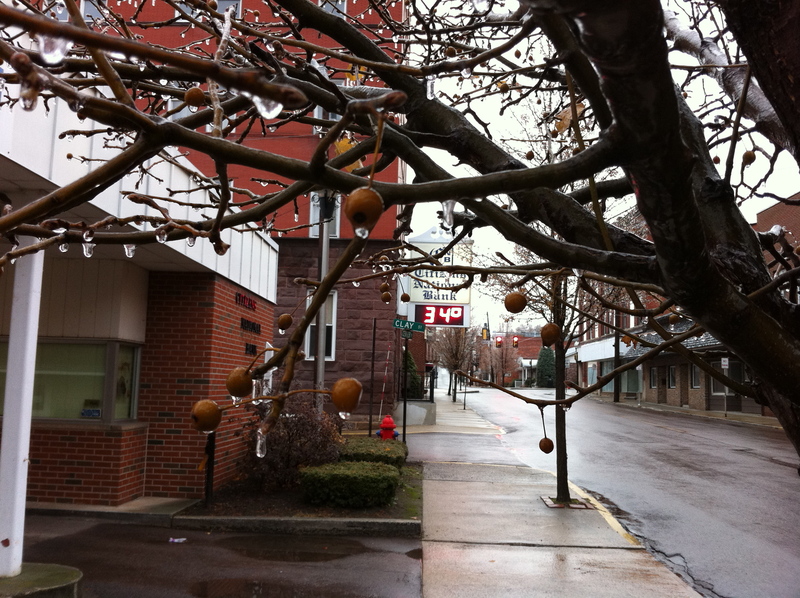 Took a stroll through town back up the hill to check out the trail conditions. Wet and sloppy, so riding the final 32 mile stretch of the trail with all the weight I’m lugging could be tough. Just hope the freezing rain doesn’t cause the state to shut down the 3,294′ long Big Savage Tunnel a few days early, as there are no easy detours and I need to get through that tunnel. 10 more miles and I would have already been through, but for visiting that wind farm yesterday. They’re calling for snow tonight, but still hoping to make it across the Eastern Continental Divide tomorrow, before the tunnel closes for the winter. Today is about gratitude, and counting all the wonderful blessings in my life. On that note, want to thank Ralph, who runs Yoder’s Motel with his grandma, for letting me use his girlfriend’s internet connection to get my website updated on this cold, wintery day. Thanks, as well, to the SHEETZ store for being the only place open in town to get some food. Only one other bicyclist on the path the entire day today. The reason: the season is definitely late. Starting to feel a sense of urgency to make DC before the weather starts turning for the worse. From what I’m hearing, the trike may not survive the C&O Canal Path, some of which is deeply rutted singletrack, so may need to shift course for the final leg of the trip. Regardless, am focused on being here now and enjoying this beautiful trail running along the Youghiogheny River. The further upstream I go, the cleaner the river is (pollution-sensitive river otters have been successfully reintroduced) and the prettier everything gets. On this video, I tried to capture the beauty of water flowing, like blood through the veins of the earth. Rained most of the morning, so rode with the ragtop on until it finally cleared up. Then came across these cool wooden bridges. 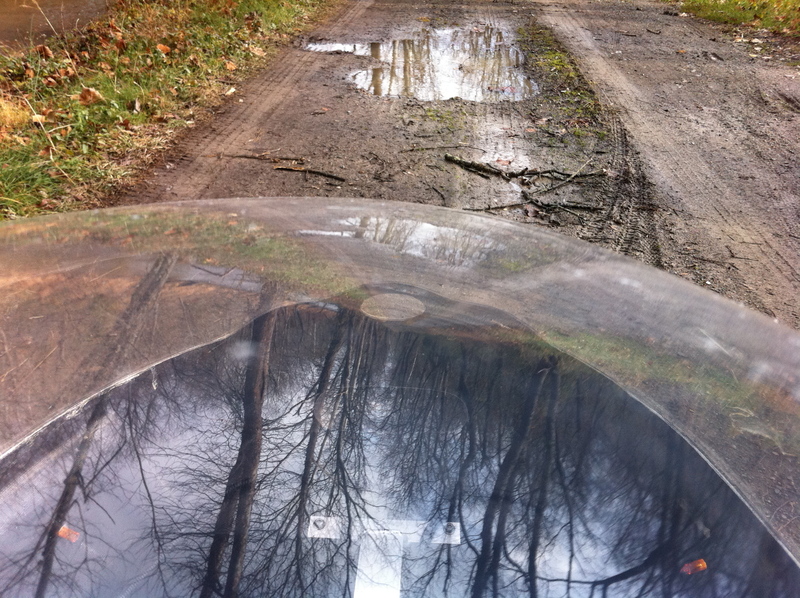 One thing I didn’t count on was how the rain on the soft limestone trail really slowed the trike down. Despite my best efforts, was only able to get in 42 miles. Ended the day at Ohio Pyle around sunset, where some hard-core kayakers were taking out of the river (there’s some really nice whitewater that loops around the town). Thought I was rugged, still peddling in shorts and sandals this late in the season, until I saw them. 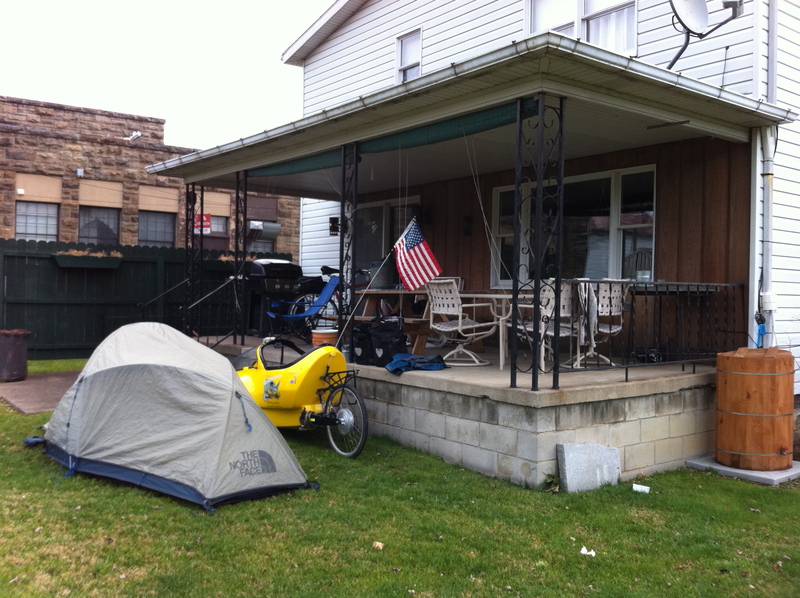 Checked the rates of a few local guest houses, which seemed awfully high for this late in the season, then happened upon a local on Main Street who offered to let me pitch my tent in his back yard. Kevin Ravenscroft later invited me in for some homemade vegetable soup, cold beer and good conversation. Oh, and can’t forget the cherry pie. Really liked the cherry pie. Thanks for everything, Kevin! Called the Pittsburgh media outlets this morning and got a call back from The Daily News in McKeesport about 15 miles down the road, where I stopped in for an interview. After getting breakfast in McKeesport, made my way to the Great Allegheny Passage bike trail, which runs 132 gorgeous miles through rural Pennsylvania. Very excited to be back on a bike trail with a front porch river view. No more cars for now. Early in the day, saw lots of evidence of the lingering effect of generations of mining in the region. One stark example was the Red Waterfall, a beautiful little waterfall on the side of the trail that runs over rock stained red from acid mine drainage. 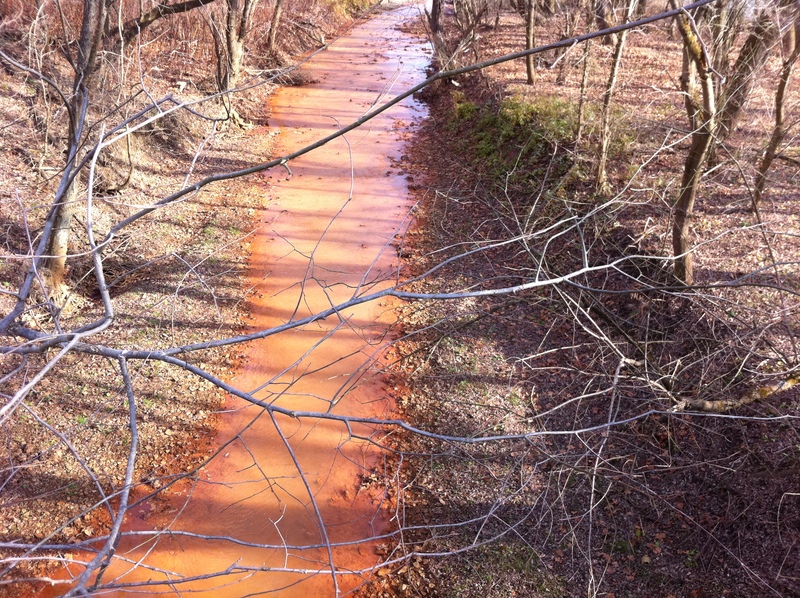 Here is a creek that runs rust red. A little past the town of Van Meter, I was told to watch for a large chunk of coal on the side of the trail (looked more like black granite), commemorating one of the worst mine disasters in history. In 1907, an open flame lamp set off a massive underground explosion in the Pittsburgh Coal Company’s Darr Mine, killing 239 miners. I was told by locals that the victims included a number of children working the mine. A lightly trodden path through the woods behind the stone takes you to the mine opening, so I walked through the falling rain to honor the dead. In addition to learning about tragedies like the Darr mine disaster, I learned other things about the history of mining in Pennsylvania while pedaling the trail. Like how Pennsylvania coal was instrumental in producing the coke (in brick ovens still in evidence along the trail) that was needed to produce steel in Pittsburgh’s famed steel mills. This same steel helped fuel America’s industrial revolution, making Pittsburgh, and coal miners, instrumental in advancing modern civilization. So Appalachia has a proud heritage that demands respect. Few have worked harder, or under more difficult conditions, than our nation’s coal miners (coal company CEOs are another story) to keep the lights on for the rest of us. But times change. We now know that coal burning poses the single greatest threat to our continued existence on this planet. So the mining and burning of coal must end, but not at the expense of hard-working coal miners, who have earned guaranteed retraining and reemployment in the green jobs sector, if not guaranteed pensions for life. Rode down the trail 33 miles, before coming across a campsite in Cedar Creek Park with a half-cabin overlooking the scenic Youghiogheny River that was just too perfect to pass up. Was as good a place as any to so a little show and tell on the rocket trike. 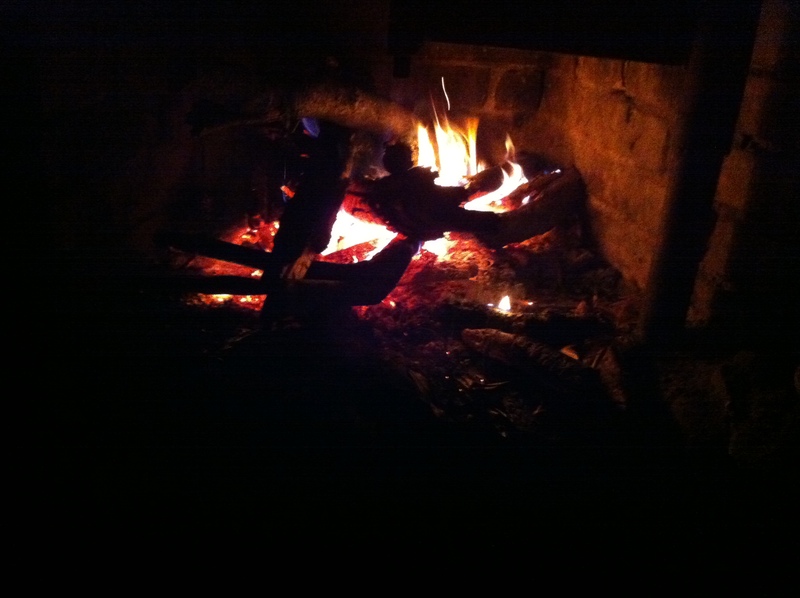 The campsite also had a fireplace, and I haven’t had a campfire this whole trip, so tonight’s the night. On a reflective note, today marks the 47th anniversary of one of the darkest moments in U.S. history: the assassination of President John F. Kennedy. By happenstance, I had the opportunity to visit Dealey Plaza in Dallas earlier this year. I walked up the grassy knoll, stood behind the picket fence and saw the “X” on the street marking where the president was shot. But you cannot kill a dream. President Kennedy’s bold call to land a man on the moon before the end of the decade was successfully achieved. Another great legacy of President Kennedy is how many people he inspired, and how many continue to be inspired by his leadership today. I chose the 48th anniversary of his historic “moon shot” speech at Rice University to launch my ride because we need a modern day, green energy moon shot today to revive our economy, put unemployed Americans back to work and protect the planet for future generations. We can choose to green our energy grid, but that would require extraordinary political leadership to rally the American people. It would also demand the rarest of traits, exhibited only by our greatest presidents: the political courage and personal strength to stand up to the powerful and wealthy special interests, in this case, the fossil fuel and nuclear lobbies. The easy choice is to keep doing things as we always have, while unemployment lingers; the economy stagnates; China claims the mantle of world economic superpower; and the climate continues to deteriorate. The hard choice, and the one that will “organize and measure the best of our energies and skills,” is for President Obama to boldly challenge the nation to renew America with renewable energy by the end of the decade.